Piston pumps and plunger pumps use a piston or plunger to push through a cylindrical chamber liquids such as water (hot or cold). 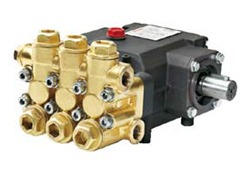 The pump is powered by a steam engine or a pneumatic, hydraulic or even electric one. Piston pumps are also called high-pressure pumps. Piston pumps and plunger pumps use a cylindrical mechanism to create a reciprocating motion along an axis, that generate pressure, forced into a cylinder or a chamber work filled with gas or liquid, through the pump. The chamber pressure activate valves, both in suction and drain. The volume of liquid spilled is equal to the volume of the chamber. The capacity of piston pumps can be calculated with the area of the piston or plunger, the number of pistons, the stroke length and speed of the device. The power of the device is proportional to the pump capacity. Piston pumps are made usign components that require a careful choice of materials based on considerations about wear and the kind of support on which they are installed. Materials used may be bronze, brass, steel, stainless steel, iron, nickel alloy. For example, piston pumps that work in oil applications may have an iron cylinder and piston with a steel rod. The piston, the suction and drain valves may come into contact with flow: the choice of materials must be made on the basis of fluid transferred. In applications where it is necessary that the pump works continuously and under strain, it’s better to use ceramic piston because they can come into contact with water and oil, but this kind of piston can’t be an appropriate choice for use with highly acidic fluids. The seals are an integral part of piston pumps used to separate the fluid from the devices that create the flow. A containment box is used to seal the joint between the chamber where the flow passes and the piston itself. The containment box may be composed of bushings, seal rings and a gland packing. The difference between piston pumps and rotary piston pumps is actually the mechanism used to transfer the liquid. The pumps where pistons move along an axis are called "axial piston pumps" while "rotary piston pumps" typically have an internal rotating mechanism that moves the pistons. Leuco S.p.A. is a leading global manufacturer of high pressure pumps ideal for use in industrial applications. The pumps are engineered in materials, crafted and tested to meet the needs of the cleaning industry. 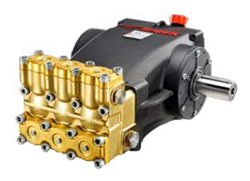 Hawk® pumps are known worldwide for their quality, their efficiency and reliability and are designed to operate in many types of applications. Solving some common problems with Troubleshooting Table.